Impressive disappearing trick I did, no? Andrew and I both took some time off of work, and took the oh-so trendy "staycation", where you take time off work and stay home. This economy is AWESOME! Andrew started this off by building me a new closet. Before you get all judge-y, remember that I'm only 5'1", and have an unparalleled love of shoes. Huge difference. I can reach all of my "everyday" stuff. There is room for all of my shoes. Andrew also redid his closet, and I've been offered some real estate over there as well. My next step is to build the closets for seasonal clothing storage, and move my spring dresses in where my suits are hanging. (Suits. As in four of them. How did I end up with four suits?) This way, my heavy winter coats won't monopolize our hall coat closet, and our guests won't have to pile their things behind the couch. Very civilized. There has been knitting. There has been spinning. There has also been some crazy awesome organization. Stay tuned. I would dare get judgey, especially on a closet! 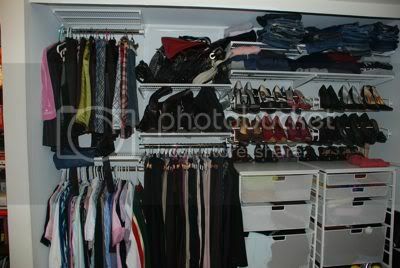 I love your closet more than I love mine - mine was 'organized' too but my husband seems to have taken over most of it. I meant wouldn't dare get judgey, doh! Ummmmm, can I borrow Andrew? I'm too embarrassed to even open my closet in front of me! 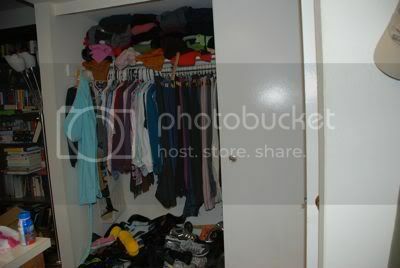 omg what a geat closet! 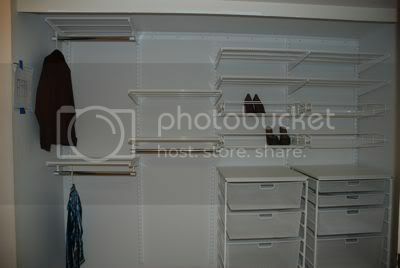 One of these day I will get my hubby to do that to my closets!! LOL Enjoy that closet.